Flash Wireless is a unique MVNO (Mobile Virtual Network Operator) present in every US market and Puerto Rico. With customers changing their mobile provider on average every 48 months leading to 6 million monthly buying decisions, US MVNOs are always looking for ways to perfect their services and better serve customers. Flash allows mobile owners to bring their device of choice when becoming a Flash customer. After a simple check in its Device Wizard Approval tool for device compatibility with its networks, Flash aims to onboard all in the shortest of time and with least operational costs. With BYOD a significant business driver for Flash, it comes with significant challenges in setting up these devices for network services. Having countless numbers of distinct device models to cater for, Flash needed accurate and always up-to-date device APN setup solution that can handle all setup scenarios cost-efficiently. 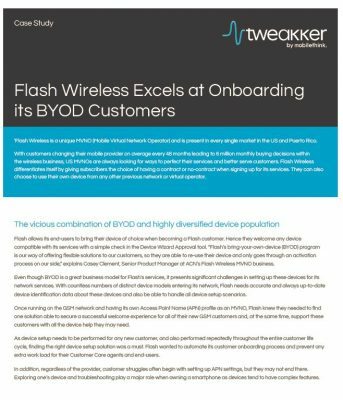 To secure the gold medal in Activating BYOD customers, Flash chose the fastest, most accurate and cost-efficient APN setup method: automatic device setup. The solution? Only One. Read about it here.